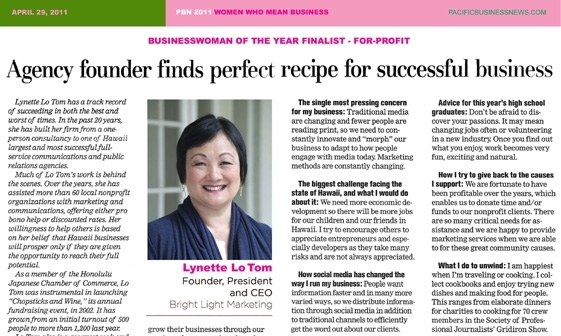 Bright Light Marketing is a leading public relations firm in Hawaii with a strong relationship with the media. We have extensive experience in media relations, creative strategy and crisis communications. From launching national brands in Hawaii to helping local companies to thrive, we help your business use the power of communications. Bright Light Marketing is a full-service public relations and marketing firm in Hawaii with expertise in crisis management, strategic counsel, media relations and special events. More than 90 percent of Bright Light Marketing’s new clients come from business referrals, a testament to our firm’s reputation for exceptional service. Our creative approach, effective strategy, and urgent attention to our clients has helped corporations, government agencies, non-profits, retail stores, restaurants and travel companies both locally in Hawaii and nationally. Bright Light Marketing’s creative flair, attention to detail, media and community connections, and focus on client needs and expectations have allowed the firm to contribute to its clients’ success.